You may remember that I had tissue paper pom poms hanging for Kate's birthday this last weekend. I'd seen them before in those Martha Stewart kits, you know, the ones that run about $20. But I didn't have $40 to spend on tissue paper flowers... do you? They looked simple enough and you can't get much cheaper than tissue paper, so just make them yourself. Run to your local Tuesday Morning to buy your tissue paper dirt cheap (don't bother with the dollar store - theirs are too waxy to work... trust me, I tried that first!). Most of the supplies you may already have, so overall, this project cost me about $8 to make 10 large pom poms. Gather your materials. Umm... I forgot to take a picture of the scissors... you'll definitely need those! 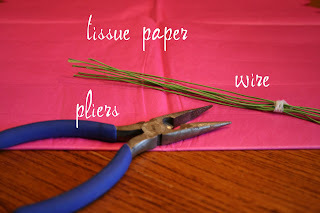 Then take a length of wire (I used floral wire since I find it easier to shape) and place it around the middle of the tissue paper bundle. Twist it right to the ends. Then make a loop by folding the wire back over itself and twisting again. Using pliers, while not necessary, seem make this step easier (and less painful on your fingers!). Then use your scissors to cut a rounded shape on both ends. I also did some with pointed ends, try doing both as it dramatically changes the look of your pom poms. Here's what they'll look like at this step. Repeat these steps until you've created how ever many pom poms you'll be needing. You'll want to wait for the next step until you're about ready to hang them. 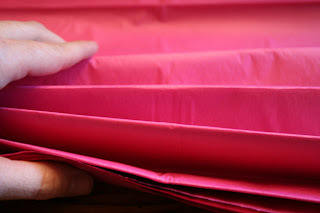 Fan out your tissue and then separate each sheet of tissue paper. Pull the sheet out and towards the center. Repeat with each sheet until the pom pom is full. You'll want to fuss around with the shape some. Don't worry - you won't mess them up. Even if you rip the tissue a little bit while fluffing it won't show. Using the loops, hang a line of fishing wire, ribbon or twine to your pom pom and hang them up. I think they look especially nice bunched together in groups of 3 or 4. *To hang them in our trees, we simply used a ball of twine and threw it over the branch. Then using a ladder, we tied them up. Kind of brought me back to my high school toilet papering days... only with less giggling and mess! I have your web address from VIOLA VIOLETTE . I will try to make your pom poms later . Love from the Netherlands ?RINI?